I’ve been on an exercise spree this year, which leads to cleaning, which leads to resources for blogging. I know, that’s a stretch, isn’t it? Well, it works like this. I enjoy long walks outside, and I don't even mind the treadmill on occasion, but then I realized that I needed to spend part of that time working, cleaning the house, washing windows… you know physical labor that burns calories and accomplishes something at the same time. Last week I emptied a bookshelf that had books and “junk” (notice the books were NOT labeled junk…) that had been collecting dust for over 30 years. It all looks so much better now, and I’m into the clean and uncluttered mindset. But, let’s get to the purpose of today’s post. 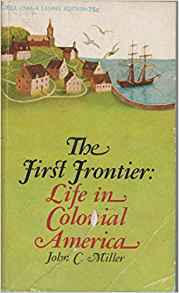 In the process of sorting the books, I found a really old paperback titled The First Frontier: Life in Colonial America and set it aside to read since I’m writing in the late 1700s, early 1800s. I hope to do a whole series of posts with some of the most interesting facts that jump out at me from The First Frontier. Chapter One touches on the journey of the Pilgrims to Roanoke in 1587 and how the entire colony disappeared without a trace. Then it moves on to tell that 80% of the settlers at Jamestown died of disease, starvation, and Indian attacks between 1607 and 1624. 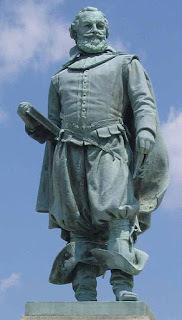 The book shares what most of us either learned in school or have read about how The Virginia Company, a trading and colonizing company, was given exclusive rights to colonize about half of the new world in 1606. Again, most of this is familiar to any amateur historian. Back to Jamestown in 1607 and The Virginia Company. The Virginia Company and its investors were all about making money, and it was believed that the new world was peppered with riches. The Company ordered one-third of the colonists to search for gold and silver and a passage to the South Sea. One online source states that there were 105 men who landed in Chesapeake Bay in April 1607. 40 were soldiers, 35 were “gentlemen”, and the rest were various artisans and laborers. So, two-thirds of the men set about building and fortifying a fort, planting crops and trying to survive in a harsh, new land, while the remaining third were on a fool’s mission—literally. They thought they found gold, but it ended up being pyrite, “fool’s gold”. While death stalked the settlement and relief failed to arrive from England, these gentlemen quarreled among themselves and accused each other of “raiding the hen roost” and “drinking up the brandy”. Seriously? It seemed to me at this point that social status and traditions from back in England, and the desire for riches should have tossed aside in favor of something as basic as survival. I’ll address several factors in the coming months that helped keep Jamestown from being wiped out completely, but the first turnaround came from an unlikely—and unliked—source. In September 1608, Captain John Smith became leader of the Jamestown Colony. He saved the few remaining colonists by making a rule that anyone who did not work did not eat. This forced all the colonists, including the so-called gentlemen, to plant food, build shelters and fences to protect themselves from attack, and to pull their weight for the betterment of the entire colony. Jamestown was always a class trip when I was a young girl. We lived in Hampton and Jamestown and Williamsburg were always exciting places to learn about. I like that rule! Thanks for the information! And I like the bookshelf too.